I have a slipped disk and I am in excruciating pain. Am I eligible for Social Security disability benefits? You have been through physical therapy and you have followed your doctor’s recommendations concerning back surgery. You have done everything that you are supposed to do, but you are still in pain, you are still unable to work, and you are still living with a disability. 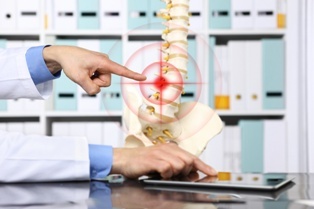 A slipped disc is one of the most painful back problems you can experience. The sharp pain, limited range of mobility in your shoulders and hips, and the radiating tenderness that shoots down your arms or legs are enough to hold even the healthiest people back from work. It can make manual labor and sitting for long periods of time impossible—it can leave you unable to do your job. You meet one of the conditions in the Blue Book Listing of Impairments. In some cases, you may meet the requirements of Section 1.04: Disorders of the Spine. Most often, the slipped, bulging, or herniated disc must compromise a nerve root in the spinal cord and result in: (a) pain, limitation of motion of the spine, or motor loss with sensory or reflex loss, or (b) spinal arachnoiditis, or (c) lumbar spinal stenosis resulting in pseudoclaudication. Your condition is equal in severity to a specific condition in the Listing of Impairments. If you do not meet any specific requirement in the Blue Book, but your medical condition has the same effect on your life as another condition in the Blue Book, then you may qualify for benefits. You are unable to work. If your condition leaves you with a residual functional capacity that makes you unable to work then you may qualify for Social Security disability benefits. The Social Security Administration will consider your physical condition, work experience, education level, age, and job skills when deciding whether you can work a sedentary or manual job. If you believe that you qualify for benefits in an any of these ways, then you may want to pursue Social Security disability benefits. Gather evidence. Pull together as much evidence as you can about your condition and the impact it is having on your life. This evidence can include doctor’s notes, imaging tests, a journal of your symptoms, work records that cite how your injury stopped you from working, and more. Talk to an attorney. Working with an attorney who is knowledgeable in federal disability law can save you time and help you increase your chances of getting your application approved. An attorney can make sure that your application is complete so that you submit a strong claim that has a good chance of being approved. Put your application together. With all of the evidence in hand, put your application together to show specifics about how your injury stops you from working. The Social Security Administration must see that you are disabled to the point that you cannot perform sedentary or manual labor tasks. Your lawyer can help you with this task. When it comes to serious back pain from a slipped or bulging disc, having a Social Security disability attorney on your side gives you invaluable support. You do not have to do this alone. Instead, we encourage you to learn more about your rights and about how to protect your disability benefits by reading our free book, The 5 Most Frequently Asked Questions About Social Security Disability, and by contacting us directly for a confidential consultation.